About a year or more ago, I was mooching around the various new and second hand dealers in the Bond Street area and – for the first time – I tried on a Patek Nautilus 5711… a watch that I’d admired from afar but never actually handled or worn myself. There was no doubt that the finish was exquisite, but for some reason I couldn’t quite to get to grips with the case shape (or, rather, the hinged non-crown side). It did teach me one thing, if nothing else, though; sometimes, the only way you can appreciate the wonderful craftsmanship that goes into many of the higher-end watches is to actually pick them up, wear them and scrutinise them properly. I’m not saying that you’ll then be able to see where the “value” is because we all know that luxury products don’t work that way, but what I am saying is that photos alone will never do them justice. I mulled and mulled over the Nautilus, but deep down I knew it wasn’t calling to me like it needed to. Around the time that I realised I wouldn’t buy one, my head was turned by it’s cousin from the other side of the tracks – the Aquanaut. Much more of a sports watch, in my opinion, and none of that strange hingey nonsense found on the Nautilus. It’s also a whole lot cheaper, especially on the fantastic rubber strap, even if residuals are horribly firm if you’re on the buying as opposed to the selling end. The next step was to wait – and this is where it all went somewhat pear-shaped, if I’m honest. Whilst I waited, I also thought, and looked, and considered. In fact I tried on as well, and one of the watches that made intimate contact with my wrist was an AP RO – not the 15300 or the classic Jumbo but the current 15400; just a tad wider than the other two at 41mm but very nicely proportioned. In fact, the more I thought about the AP, the more I was steering myself in it’s direction at the expense of the Aquanaut. I liked the fact that it was genuinely a horological icon (I know, it’s silly really, but for me it’s an element of that intangible added value that forms part of my decision-making); I liked that on the wonderful bracelet it was comparable price-wise to the Aquanaut on rubber; and – if I’m honest – I liked the fact that it just seemed a little more… I don’t know. Maybe a little more refined. 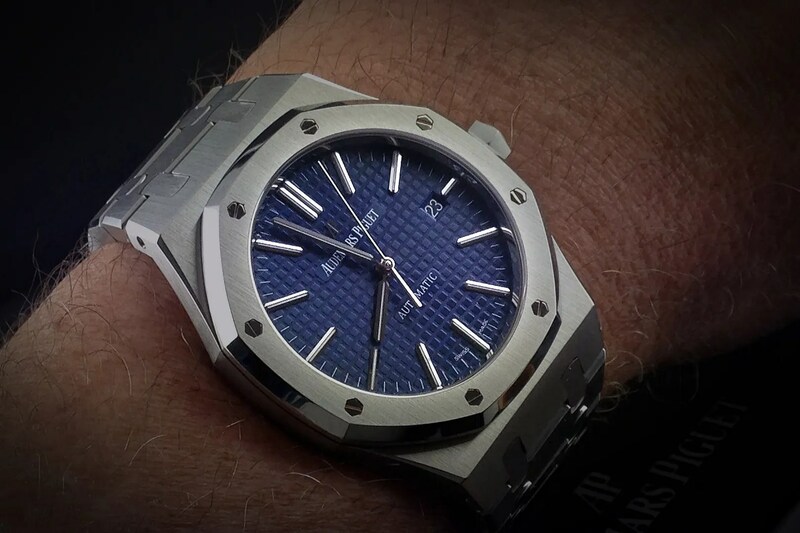 Just a quick word about the history of the Royal Oak before I go on, because since its release at the Basel fair in 1972 this watch has achieved a status that nobody would have assumed possible. Famously designed by the one and only Gérald Genta, it received a slightly mixed reception at first, with many finding what was then considered a slightly quirky, iconoclastic design a little too different for comfort. 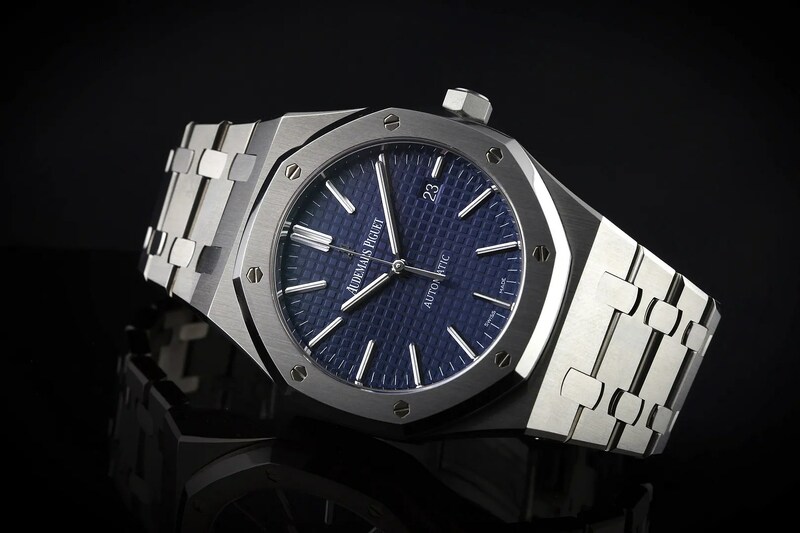 It has to be said that cost was also an issue, with the RO in stainless steel being listed for more than some of AP’s already-established models in precious metal. Quite a bold step when you think about it; it needed to be, though, because the Royal Oak was AP’s answer to the quartz crisis and they certainly needed to pull a rabbit out of the hat… things weren’t looking very clever for them at the time, anyway. Gérald Genta passed away at the end of summer 2011 having founded a brand under his own name and having never stopped designing watches. In fact, for a few years in the mid-1990s he also held the honour of being the designer of the world’s most complicated watch, with his incredible Grande Sonnerie Retro which – even back then – was priced at around $2million! He’s remembered, and will no doubt always be remembered, for some of the greatest designs in 20th century watchmaking, and for the avant-garde nature of his vision. •	The 15300 – 39mm case, and a pretty classic choice (albeit superseded now). Blue, black or silver dial. •	The (current) 15400 – 41mm case but a seemingly slimmer profile than the 15300 and so just as wearable when all’s said and done. 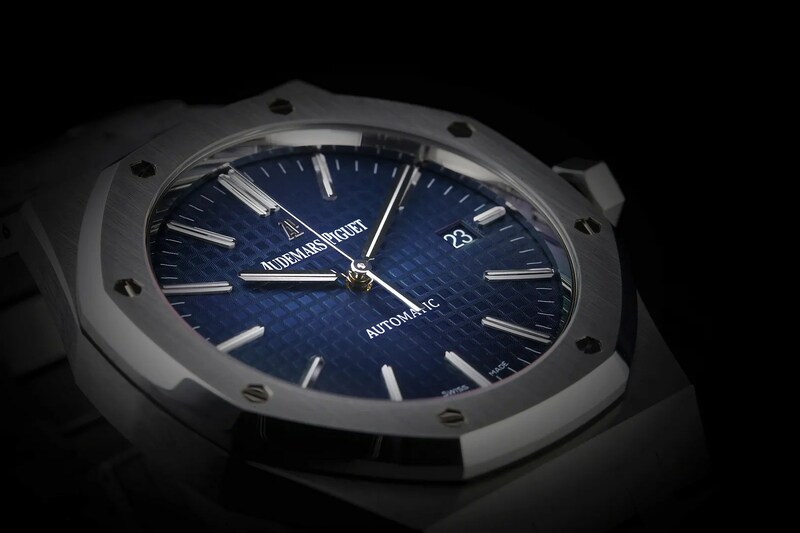 Black or silver dial, with a rarer LE Boutique Edition in blue. 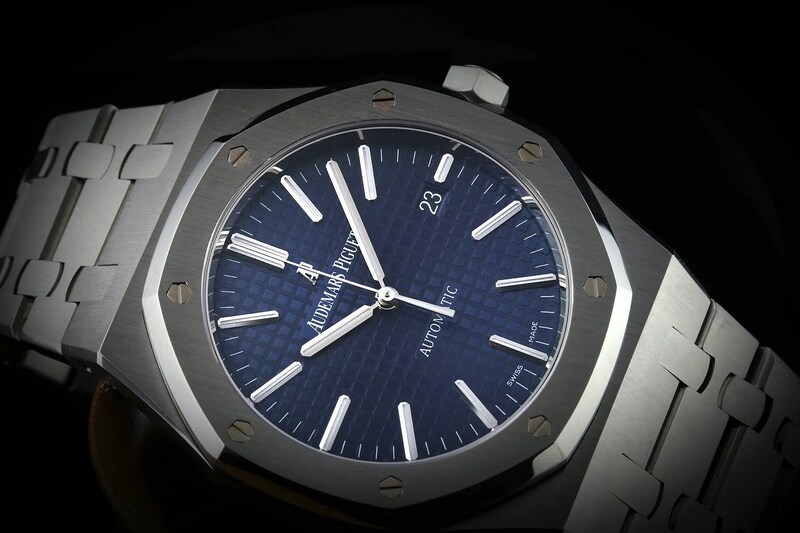 Now, AP only made a limited number of this model/dial combination for AP boutiques, and I liked the fact that it was a little scarcer than the more easily spotted models. That aside, though, it housed the same (gorgeous) in-house cal. 3120 movement as the 15300 and the other 15400 variants. I suppose the only other thing worthy of note is that the 15400 saw the end of the AP logo at 12; I like the cleaner dial, and I also like the fact that, if anything, it’s truer to the original. In other words, I found that my decision was made, and within about 48 hours of me hearing about the watch’s availability in the first place I’d agreed a deal with our friend at WOS and paid for it. Not that many hours later, the doorbell signalled it’s arrival and it was pretty immediately adjusted and on my wrist. I hinted earlier that it’s hard to do justice to some watches, because they need to be handled and worn in order to be properly appreciated. I could ramble on about the simply fantastic casework, with wonderfully brushed finishes contrasting against adjacent highly polished facets. I could talk at length about the octagonal bezel with its perfectly aligned faux screw-heads that give it an appearance that quite a few have tried to copy without success. I could even talk about the integrated bracelet, which is of supreme quality and is one of the most comfortable that I’ve ever worn. Finally, I could try to explain the sheer depth and “blueness” of the tapisserie dial; it’s not just blue but it’s a whole range of blues – not in the way that Rolex achieve that with their sunburst finish but in a totally different way. It’s even subtler, if anything. All of this could only fail to convey the reality of the Royal Oak, though, because descriptions and photos don’t even get close, in my opinion. All in all, it’s a bloody beautiful watch – perhaps not the one that I thought I was going to buy a year ago, but the one that I probably knew I’d buy the moment I first tried it on. I suppose all that’s left is the photos… not sure that I can do a good enough job, to be honest, but I obviously couldn’t stop myself from trying! 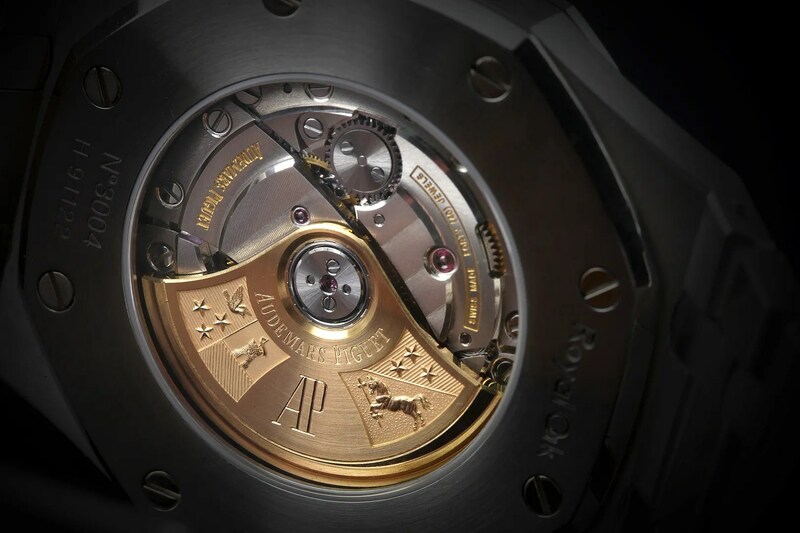 This entry was tagged Audemars Piguet. Bookmark the permalink. Hi Tony, I just came accross your blog and I enjoyed reading your writings. Initially I was googling for “Moser Mayu Marrone review” as I just got mine last December. It was the same exact model like yours, white gold with brown dial. I fully agree that it is the most beautiful watch that i ever handled. Now I was beaten by another bug. I am in a journey of finding a weekend/casual/sporty watch. My wrist is fairly small a shy less than 6.75″. The candidate is PP 5167 on rubber or AP RO (15450 or 15400). I went to my regular AD and tried on the 5167. They only had one in SS. I didn’t get a chance to try the RO as they were sold out. The price difference is quite significant. I was offered 15400 black dial for USD 7k less than the 5167. Do you think the price difference is justifiable? Also, is it true that the bracelet of the RO is a scratch magnet? Hi Maikeru. and thanks for your comments about the blog. Interesting dilemma you face, much like my own. The 15400 is a wonderful watch, but I have to say that on my 6.75″ wrist it’s about as large as I can go. Now, if you have a flat (as opposed to round) shaped wrist you may still be okay, but I suspect you’ll be pushing it with regard to size. With regard to the bracelet, mine has been okay so far, but I tend to wear it when I’m dressed up a bit, as opposed to using it as a weekend watch. Everything you say is – for me – pointing towards the 5167, which I still love and would still love to own. Maybe you should try a 39mm 15300 on for size too,before making a decision? Hi Tony, thanks for your reply. I used to own a Panerai Luminor 510, Omega speedy pro and Sinn U1. The 44mm Luminor Panerai is probably my limit. Since you also own a Submariner, how is the 15400 fit compared to 40mm Submariner? Where I am living right now, finding a used 15300 is pretty challenging. It wears a lot bigger than a Sub, mainly because of the integrated bracelet design. I do know what you mean about finding a used 15300, especially one that has retained it’s sharp edges. I was very young then and ignorant of haut horlogerie and I remember being absolutely stunned !!! Just beautiful…I had the privilege of meeting Mr Gerald Genta in Monte Carlo, a real gentleman and a great genius of a watchmaker. Amazing! How did you come to meet him?